Contact us to find out how Deck Guru can solve your deck problems or simply schedule free no obligation estimate online. We will send our team to evaluate your deck and give you an estimate. Our team will arrive at a scheduled time. The estimator will measure the deck and evaluate the condition of the wood using our comprehensive 25 point Deck Guru Inspection and provide different option for you particular case ( Deck Resurfacing , Deck Re-Facing , Complete Rebuild or Extreme Deck Make over by Deck Guru) provide you with a written estimate for your review. He will also offer assistance in choosing the best color/color combination and materials for your deck. If the price fits your budget contract will be signed . Deck Guru scheduling team will put you on schedule and Deck Guru production team will start working on your order to make sure its done as fast and efficianly as possible . The Deck Guru Clean Team will clean your deck and restore it back to its original appearance using our patent pending low-pressure cleaning system that won’t splinter and damage your wood. The Deck Guru Carpentry Team will re-secure your entire deck, including rails, stairs, lattice and re-nail all loose nails. They will also replace all warped and rotting wood with the same type of wood originally used on your deck. The Deck Guru Team will apply our revolutionary composite coating that eliminates cracks,splinters and yearly maintenance, as well as prtotects your deckfor 10 years. 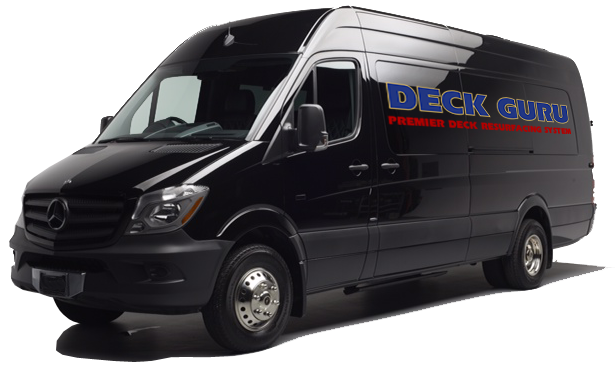 Deck Guru will deliver chosen decking materials straight to your house inluding wooden boards, rails, structural memebers if needed and prepare job site for our master carpenters to take over . Deck Guru Team will perfom all necesasary demolation and haul away work prior to installation of the main decking materials and make sure structural beams and joists are safe and sound and job site is properly prepared for an install. Deck Guru master carpenters with start main installation of the chosen materials following Deck Guru Platinum standarts of workmanship and safety rules . Foreman is present at the site most of the time to address questuions / issues if they may arise . The team leader will then do a final post inspection and complete a walk-through to make sure you are happy with the results. Cleanup. Finally, we leave your home as we found it, cleaning up all debris and trash.